Have you learned how to can potatoes? This is my favorite way of storing small new potatoes for long term storage. I love the flavor of canned new potatoes sautéed in butter and sprinkled with parsley, salt and pepper. Since these are early potatoes, they are small and pretty uniform. They are firmer than and not as mealy as the mature ones. After canning, the new potatoes are still firmer than the older ones. To can new potatoes, they must be hot packed. First, wash freshly dug potatoes that are uniform in size and color. Cook in boiling water about 10 minutes; the peel can be RUBBED off. Do not stick potatoes with a fork or knife. 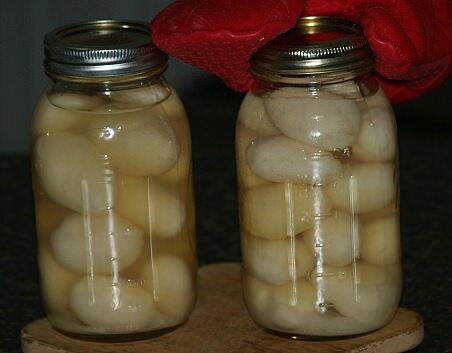 Pack hot peeled potatoes in hot sterilized jars; cover with boiling water leaving 1 inch head space. Adjust the lids and process under 10 pounds of pressure; pints for 35 minutes and quarts for 45 minutes. If you want to know how to can potatoes other than new potatoes, these must also be hot packed but there is a little difference from the new potatoes. These also must be canned under pressure. The difference is that because of the larger size of these potatoes, they must be cut into smaller more uniform pieces. Wash, peel and cut potatoes into ½ inch cubes; dip cubes in brine made with 1 teaspoon salt and 1 quart water to prevent them from darkening. Drain from brine and then cook in boiling water for 2 minutes. Pack the potato cubes in hot sterilized jars; cover with boiling water leaving one inch at the top. Seal jars with lids and process at 10 pounds of pressure; 35 minutes for pints and 40 minutes for quarts. Many people learn how to can potatoes but never think about canning sweet potatoes; maybe they do not like them as well. After sorting sweet potatoes and checking for blemishes, wash them thoroughly. Drop them in enough boiling water to cover completely and cook about 25 minutes; this will make it easy to slip off the skins. Cut the potatoes in uniform pieces about 1 inch chunks and pack in hot sterilized jars. Cover the potatoes with boiling water leaving 1 inch head space at top. Place lids on the jars and process with 10 pounds pressure; 55 minutes for pint jars and 90 minutes for quart jars. If you learn how to can sweet potatoes, this will be a delicious recipe for you to try. Mash sweet potatoes; mix with ½ cup melted butter, eggs, milk, sugar, vanilla and coconut. Place in a greased casserole baking dish; mix topping. Combine flour and sugar in bowl; stir in pecans. Add ½ cup melted butter and hot water; spread on top of sweet potatoes. Bake at 350F degrees for 30 minutes. Since I learned how to canned potatoes, the new potatoes were always my favorite. Heat butter and soup; add sour cream and cheese and blend into potatoes. Add pepper to taste and dump into a large greased casserole dish. Bake uncovered at 300F degrees for 30 to 45 minutes or until brown on top. After I learned how to store potatoes, I found by canning new potatoes I was able to quickly prepare many great potato recipes. Microwave peas or place in boiling water until tender crisp; rinse with cold water until cold and drain. Combine mayonnaise, yogurt, mustard, onion, dill, garlic and blend. Cut potatoes into small chunks; combine with peas and mayonnaise mixture. Add salt to taste and toss to coat; refrigerate at least 1 hour before serving. Heat ¼ cup molasses and ¼ cup butter in skillet; add apples and turn to coat. Simmer apples for a few minutes until barely tender. Drain potatoes and mash; add remaining molasses, remaining butter, orange juice, rind and salt. Beat sweet potatoes until light and fluffy; mound on top of apples to serve. Heat butter, garlic and lemon juice in a large skillet. 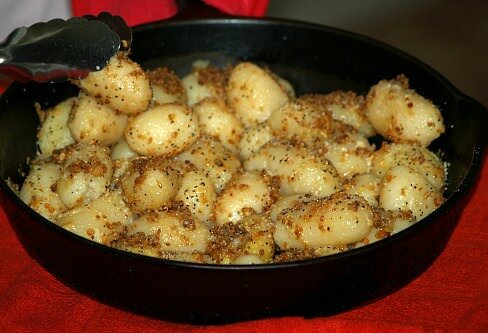 Drain potatoes, cut in small pieces and add potatoes to skillet; heat slowly tossing to coat. Sprinkle with paprika, salt and pepper; serve when thoroughly hot. When you learn how to can potatoes you can add a simple glaze to make them special. Place drained sweet potatoes in a buttered casserole baking dish. Combine maple syrup, apricot juice, lemon juice, butter, cinnamon and nutmeg in a saucepan; bring to a boil for 2 minutes. Pour hot mixture over potatoes in casserole dish; bake for 50 minutes. Learn how to can potatoes and make this recipe for garlic potatoes throughout the year. Drain potatoes and place on paper towels to absorb all liquid; place in a large bowl. Melt butter in a small saucepan; add garlic and stir over heat for 1 minute. Pour garlic butter over potatoes; add half of cheese, salt and pepper and stir to coat potatoes. Dump mixture into a casserole baking dish; top with remaining cheese. Bake about 30 minutes uncovered until golden brown.